You can easily drill through stones. To start drilling, all you have to do is swipe down. But, unfortunately, you cannot drill through bombs. Avoiding them is the best way not to get hurt. Your miner will take damage if he hits a stone, and you may still be able to continue playing with reduced HP. But if he/she hits a bomb, then chances of getting killed are more. His HP decreases considerably and may even reach zero on first hit. However, you can ensure your miner’s HP does not reach zero by increasing his total HP stats. All you have to do is equip those items that can increase the total HP of your miner. With an increase in HP, a bomb will still do damage, but your miner’s health won’t be reduced to zero on first hit. You can imbue equipped items to get bonus health points. Keep imbuing all equipped items and you never know which item grants some health points that will permanently increase your miner’s HP. You will have to be quick in swiping left or right when you spot bombs. Bombs will appear frequently in “Heroic” mode and appear in clusters, so be very careful when you spot one and try to swipe away from it. Many times, the game will throw a mix of stones and bombs. You just need to drill through stones when you spot them and just stay away from bombs. Stumbling upon a bomb is something you cannot avoid, and you will find plenty of them as you dig further into the ground. You have two options to avoid them: Quickly swipe left or right or keep collecting blue vials to activate Magic SuperDrill, which will make your miner super-fast and can drill through any object, including bombs. A SuperDrill can last only for a few seconds, and I know you would love to have this beast for a few more seconds. Well, you can boost Magic SuperDrill duration by increasing its stats. To do this, you will need to equip those items that add magic points to the total Magic SuperDrill stats. You will also have to craft different types of items and imbue them to add more magic points. The Magic Super Drill duration increases by 1 second for every 10 points of magic added to “Magic SuperDrill” stats, which can be accessed by tapping the helmet icon on the home screen (check the screenshot above ). It will take you to “Your Gear” section. If stats show “10”, then the superdrill duration will be increased by 1 second. At “20”, it will increase by another second and so on. You can check how many extra seconds you received by increasing magic by tapping a level on the level map. Bonus seconds will be shown under the quest description. Whenever you find a new material, go to the Experiment section and start combining it with other materials to discover a new item. Different combinations yield different results, so you should add two different types of materials to find something that might increase magic, health etc. However, sometimes, combining two different types of materials won’t give any results and the AI will display “wrong combination”. You will have to keep experimenting to get the right combination. Do remember that after experimenting, you will have to craft to get the item. When you experiment, you just know the outcome of combining two materials. You can then combine the same materials to craft that item in the “Crafting” section. Most of the times, you will be short of the required materials. You can replay older levels or try the Heroic mode, which unlocks when you get 3 stars in a level. Looking for that rare Hipster Cloth? Can’t find 30 W bulbs? To find materials required to create a new item, go to the level map and tap on a completed level. Under the “Ingredients” section you will find a list of items you might discover while digging the ground. Try to gain 3 stars in a normal level to unlock Heroic mode. You will get Heroic-only ingredients which can’t be found on normal digging zones. Imbuing items unlock additional perks that can increase health, magic and even decrease the speed of your miner, making it easier for you to swipe left or right when you come across any obstacles. 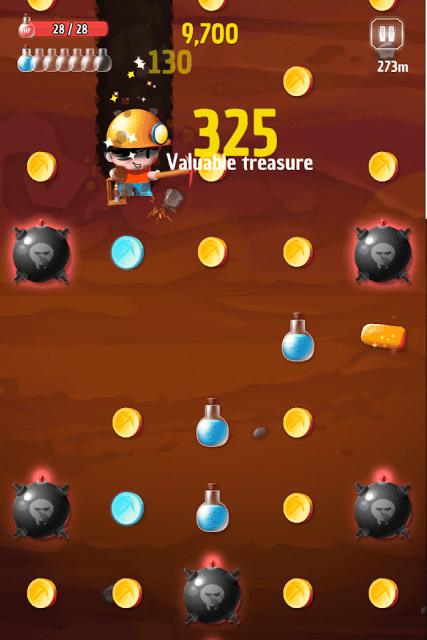 With a fast moving miner, it becomes very difficult to swipe quickly and chances of hitting a stone or bomb are higher. To imbue an item, you will need Magic Dust (pink vial). Now to get Magic dust, you will have to “Shatter” or break an old/unwanted item. Choose those items that you really don’t need. Compare an old item with a new item and see whether the latter has better stats than the former. So if you have two pickaxes, then shatter that pickaxe whose stats are inferior to the other. Normally, an item will show number in red suggesting that its stats are weaker than the other item. Shattering an item will grant magic dust. Now it depends on the item’s rarity. The rarer and better an item, the more magic dust you will get. An imbued item will grant more magic dust than an item that hasn’t been imbued yet.